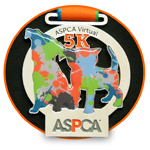 This June, we will be participating in the inaugural ASPCA Virtual 5K! We are excited to be participating and honored to be raising the awareness and the much needed funding to support the ASPCA's programs. The most excellent Einstein had surgery in January, replacing his ACL, and recovery has not been quick, with a slip in early April and an infection in May. Hopefully, we are on our way to the final stages of strength-rebuilding, gaining back the muscle he has lost in that leg. I have been a member of the ASPCA for some time now and support them AND the HSUS in their efforts around the country. Volunteering with both of those organizations, as well as my local shelters, and adopting four different shelter animals of my own have shown me how important this work is. This inaugural Virtual 5K seemed like the perfect opportunity for Einstin and I to help the ASPCA to raise money while also having a goal of him walking 3.1 miles on some day between June 10-30. We are already walking between 1.5 - 2.0 and I KNOW he can do it, even if we need to take breaks! The ASPCA is very important to me and I appreciate your help as we fight to give abused and homeless animals a second chance at life. Please support us by making a donation and help us make a positive impact in the lives of animals! Einstein, and all of the other shelter dogs (and cats!) thank you.